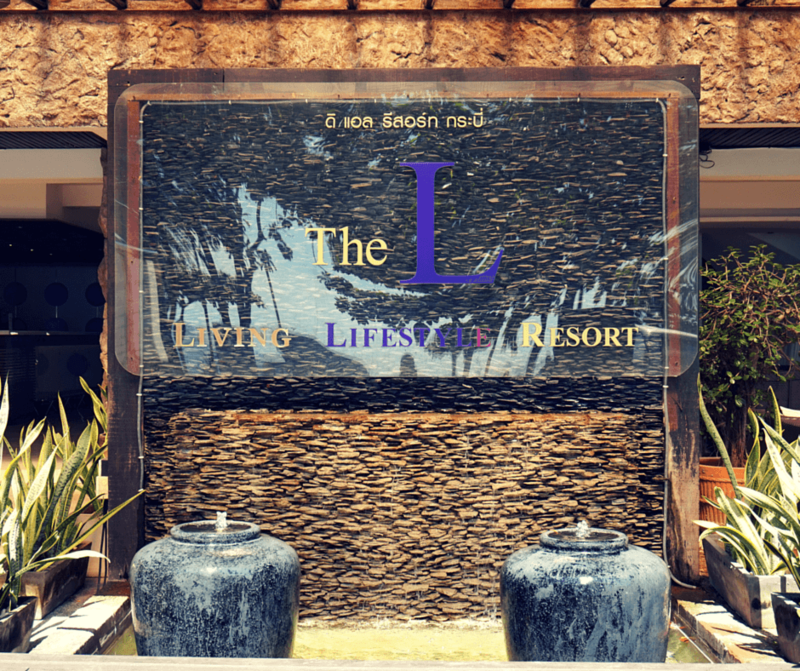 Krabi certainly has its fair share of resorts, but if you’re looking for a modern stay in a great location with excellent service, then you have to stay at The L Resort. I fell in love with The L Resort as soon as I walked into it’s open air lobby area. I really liked the modern decor and the color scheme (purple is my favorite color!). I was greeted with a great big smile by Noawarat; she ended up being invaluable and gave me plenty of suggestions for places to go and things to see while in the area. When I walked into my room, I was happy to see there was plenty of space, a refrigerator, and complimentary umbrellas and beach towels. There was also a TV and iPhone docking station. As I continued to move through to the bedroom, again I was very happy with what I saw. I nice big bed and an awesome bathroom, complete with a large shower and tub. Other rooms in the resort were being renovated and will be ready by January 2016. I know they will be amazing and will exceed all expectations. Michel, the Guest Relation Manager, was kind enough to provide some computer animations of what the finished rooms will look like. Renovations are now complete! Look at how amazing these rooms look. And the pool!! Wish I could go back right now! And my favorite thing about the resort? The location! It’s in the center of town, with lots of restaurants and shops literally around the corner. It was fun to go out, walk, and take in the many sights and smells. People gathered every evening on those steps to watch the sunset. It was truly spectacular; watching the colors slowly change is something I will never forget. So if you’re looking for somewhere to stay in Krabi that is steps from the beach, has great food, and a friendly staff, then we would definitely recommend The L Resort. I love the modern decor, very chic! You can never go wrong with a location right on the beach either. The L looks so sleek and modern. Love that it’s right on the beach too! Great to see this post because, guess where we are, right now? Ao Nang, Krabi! We have walked by the L resort many times and because of your suggestion, we had dinner at Wanna’s Place. We all had the rib eye steak and LOVED it. Thank you for recommending it. The resort also looks nice and the location definitely a huge plus! Glad you enjoyed Krabi as much as we are. In the US a hotel like this would have easily cost a few hundred dollars, but in SE Asia it’s always a fraction of that! You sold me with the hot stone steak and then I saw the views! Wow! Stunning! I love the Thai boat in the sunset. One of my favorite things about travel in Asia are the beautiful hotels! The style, the customer service and amenities are just not easily found (for the price) elsewhere. Beautiful hotel! Hi Karilyn! You’re so right, the prices are so much more affordable! Looks like a great hotel. Nice that they provided you with umbrellas. That is different. Yes, those little details and extras are always nice. Oh this is a dream! I love the neat aesthetics and purple tones, I’d devour that food just now. Great post, nice bit of Asia for my morning! Great location, close to attractions and walkable, plus it’s virtually on the beach. Looks like a perfect resort. That restaurant looks amazing–I love the idea of a hot stone steak, sounds like fun and looks so delicious! The rooms look so nice and I really like the purple 🙂 And, can’t get much better with a beach right outside! Great find! Looks nice, clean and comfortable, but a little too simple for my taste. I like a little more luxurious resorts. I love the resort! it is very beautiful! This looks absolutely fabulous. We love Krabi and Ao Nang and stayed a few minutes drive from the beach at a beautiful pool villa resort. It was amazing, but it also would have been nice to spend a few days here. We’ll keep it in mind for when we return! Thanks for the recommendation and all the great information, I would certainly consider staying at The L Resort the next time I visit Krabi. It was the only time I had steak while in Thailand lol! But it was awesome! This place looks phenomenal! I love the purple touches in the decor. Though I’ve been to the Thai islands, I didn’t make it to Krabi, but those photos and the other photos I’ve seen of the town make me yearn to visit! I really enjoyed Krabi. There were still tourists, but I think it’s still a lot less crowded than some of the other Thai beach towns. It really was a great place to stay! We just came back for 10 days in Krabi and loved it. Too bad we didn’t know about the L Resort and Wanna’s!